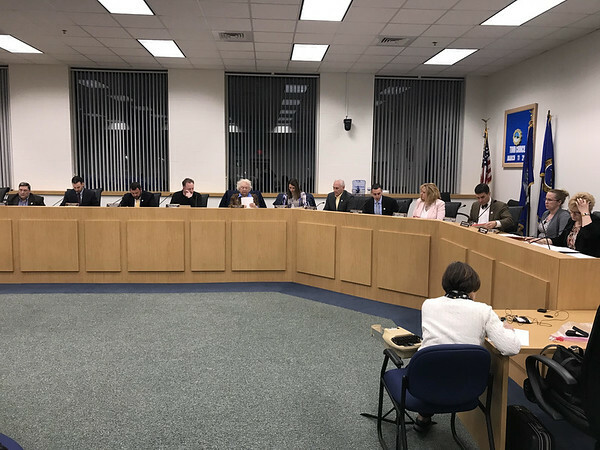 SOUTHINGTON - A proposed resolution opposing highway tolls in Connecticut was defeated 5-4 along party lines at Monday’s Town Council meeting, which was attended by more than 40 members of the anti-toll group No Tolls CT and local legislators. The proposal had been included on the agenda after a request by Republican Councilor Tom Lombardi at the council’s last meeting. However, after a two-hour discussion, the proposal was defeated, with Democrats Chris Palmieri, Dawn Miceli, John Barry, Kelly Morrissey and Chris Poulos voting against it and Republicans Mike Riccio, Tom Lombardi, Victoria Triano supporting it. State House Speaker Joe Aresimowicz, a Democrat who represents Southington and Berlin, spoke at the meeting. Republican state Reps. Gale Mastrofrancesco, who represents Southington and Wolcott, and Rob Sampson, who represents Southington, attended but did not speak. Former Republican legislators Len Suzio and Joe Markley were in the audience. According to Town Manager Mark Sciota, 40 to 50 members of No Tolls CT attended the meeting and several spoke during public comment. They also held a protest along Route 10. Lombardi said that Aresimowicz told the council that there are still “a lot of unknowns” regarding the toll proposal. He said he thanked Aresimowicz for attending the meeting, since tolling is an important issue to residents. Palmieri could not be reached for comment. A public hearing was also held on the 2019 community development block grant, but there was no public participation. Sciota said the town is pursuing an $800,000 grant, which includes both state and federal funds, which will be used to renovate Southington Housing Authority properties. “The most recent renovation occurred in 1984 and it just goes backwards from there with many other buildings,” he said. Posted in New Britain Herald, Southington Herald on Tuesday, 26 March 2019 20:32. Updated: Tuesday, 26 March 2019 20:34.